Honda Shadow Forums : Shadow Motorcycle Forum > Vendors > Motosport.com > When It Rains - What Motorcycle Rain Gear Do You Ride With? Motorcycle rain gear comes in many types, designs and styles, though there are some commonalities. Most rain gear is designed to be worn over your normal riding apparel, except for gloves made specifically for the rain. All motorcycle rain gear is waterproof and should be easy to put on and take off when needed. Gloves made for severely wet weather often provide heating capabilities which is very important as the evaporative effect of water is a chilling experience. Deciding on the best motorcycle rain gear comes down to your style of riding (commuting, touring, racing), features, the fit, appearance, and of course how much you want to spend. Choosing good motorcycle rain gear is mostly a personal decision which depends a lot upon your needs. 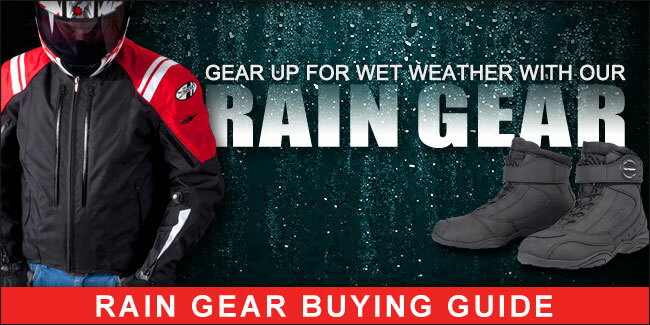 Now head over to MotoSport.com and check out the rest of the Motorcycle Rain Gear Guide including gear recommendations for riding your Motorcycle in the rain!